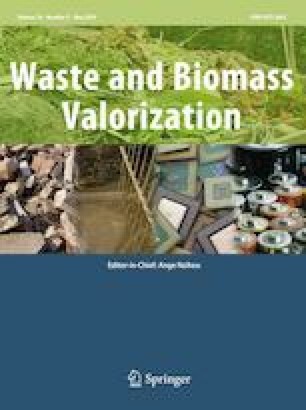 The objective of this work was to investigate the transesterification kinetics for biodiesel preparation from waste cooking oil under electric field. The experiments were carried out in a batch reactor with waste cooking oil and methanol at molar ratio of 1:6 at the atmospheric pressure with 1% weight of the catalyst KOH. The product concentrations were measured during reaction process at various conditions to determine the reaction rates. The effect of operating parameters such as temperature and voltage was investigated. It turned out that the reaction completed fast in the presence of electric field, where conversion rate was remarkably raised. The charged liquid dispersion processes were also studied to reveal the mass and heat transfer mechanism for transesterification through liquid–liquid interface. By applying the Arrhenius equation, the activation energy and the frequency factor were found to be 57.71 kJ/mol and 1.39 × 107 s−1, respectively. Electric field was found to be high efficiency for biodiesel preparation enhancement. This research is supported by National Natural Science Foundation of China (No. 51761145011), Postgraduate Research & Practice Innovation Program of Jiangsu Province (No. KYCX17_1776) and Natural Science Foundation of Jiangsu Province (No. BK20150511; No. BK20160517). The authors appreciate their support on this work.